It is believed that you are subconsciously more attracted to the crystals you need in your life. 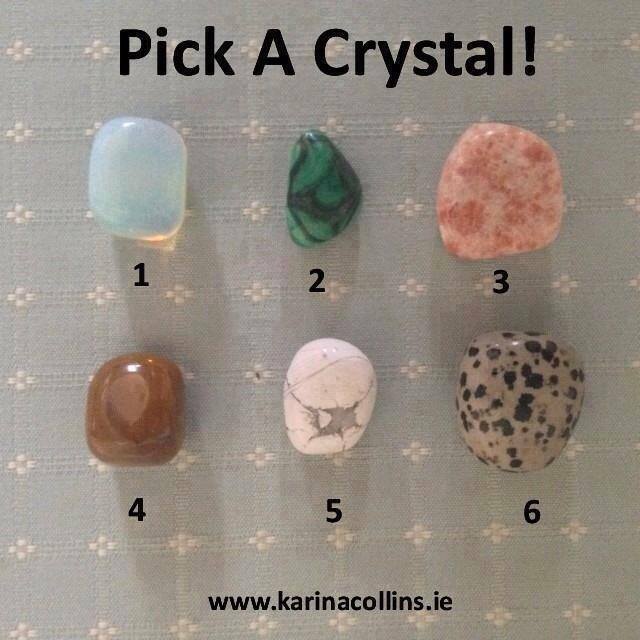 Look at the 6 crystals below and see which one you are most drawn to. Don’t just choose your favorite color- pick one that attracts you naturally. Given below is the explanation of your choice of crystal- don’t cheat! Just pick the one that you feel most attracted to! You tend to seek freedom and crave being in a place that offers you peace and calm to help you hear your inner voice. Have you been feeling disconnected and stressed out? Are you unsure of the path that is laid out before you and you need some alone time to think? This cloudy stone reveals that your vision is blocked by the hustle bustle of daily life, and you need to take some time alone. As we are approaching the new year, make it a point to find some time everyday to spend with yourself, assess things and spend a few moments in contemplation to think about your goals and allow thoughts to pop into your head out of the blue. If you’ve been attracted to this stone, it suggests that you are about to go through a major change or transformation in your life. This change can be practical and can change the way you’re living your life, or it can go much deeper. This stone is a symbol of evolution and signifies that the blockages in your life and body that have been due to past experiences are now being released and untangled. You are now slowly becoming more wise and learning to truly value yourself and are understanding what you want and what you don’t. Malachite is also the stone of abundance and prosperity, and it signifies that fortune is waiting for you. It can also signify the end of a destructive romantic relationship, and the arrival of new, pure love. If you’re attracted to this stone, it signifies that you’re now starting to feel more optimistic about the future. This stone signifies that the power of the sun is energizing your body and improving your health while reducing your stress and fears. It is also a sign of good luck, and signifies that things are about to get better for you. Imagine a day when you wake up in the morning and your first emotion is joy. Just pure joy. This stone points out that you have incredible strength to overcome your problems and make magical alternatives appear. If you’ve been praying for a miracle, wait, because your time is coming. This stone is the stone of closure. If you chose it, it means that your unconscious mind is ready to break out of the negative habits, and truly be happy. It also signifies that you are now being more grounded, and you can finally see that you are much more fortunate and lucky than those around you. You are now able to acknowledge that other people have their problems, and the energy blocks in your system which earlier caused you to develop feelings of bitterness, jealousy and misery are now fast disappearing. At last you now have the willpower to break free of all the negativity and embrace peace for real. This breakthrough will help you find long lasting happiness in the near future. If you are attracted to this stone, it signifies that you have been receiving messages from the other side either through dreams or by means of certain visions, or seeing certain numbers repetitively. It signifies that you are being guided on an intuitive level, and that you are ready to acknowledge it too. Since you are now going with the flow, you will also experience more spiritual breakthroughs and you will realize that you are not alone in this journey. This crystal also signifies that a new spirit guide is awaiting you, and your guide is planning to elevate you to a level that goes beyond your wildest dreams. If you chose this crystal, it is a sign that you need to invite more of fun and humor back into your life and that the little voice in your head is screaming- let’s play again! It is possible that you may be feeling disoriented or worried, and this crystal is here to remind you that you are just a spiritual soul that is having a physical experience. It is guiding you to make the worst of all situations better by bringing more humor into your life, not just for your own sake, but for the sake of those around you too. A good sense of humor is what binds families and friends together and makes coping with difficult times a lot better, and that’s exactly what you need.